Whether online or face to face, large classes are challenging! As always, Maryellen Weimer shares some great suggestions in this article from Faculty Focus. After completing the assigned reading, students take a short online quiz that must be completed before class. Their answers help guide that day’s lesson. Technology continues to expand at an exponential rate. The growth of technology has helped to improve our productivity and efficiency, which in turn helps to fuel even more advancements. New technologies are redefining almost every industry, including computing, medicine, manufacturing, transportation. There are seemingly new, amazing breakthroughs everyday, many of which have the opportunity to completely change the way we live our lives. You have probably have heard about some of these technologies before, however, these products have yet to even scratch the surface of what they will be capable of in the years to come. Here are 4 emerging technologies that I believe will change the world over the course of the next decade. Brain-machine interface is a technology that allows communication between a human and an external technology. This technology can refer to an interface that takes a signal from the brain to an external piece of hardware such as a robotic arm, leg, or even eye! Neural Interfaces have the capacity to improve the lives of millions of people. Augmented Reality is a live, direct, or indirect, view of a physical, real-world environment whose elements are augmented by computer-generated sensory input such as sound, video, graphics, or GPS data. Technology such as Google Glass, will completely change the way in which we interact with the world around us. 3D Printing is the process of converting a digital file into a three dimensional solid object. The creation of a 3D printed object is achieved using additive processes (laying down successive layers of material until the entire object is created). Driverless, or autonomous, cars refer to vehicles capable of fulfilling the main transportation capabilities of a traditional car. Simply put, they drive themselves! In places such as Nevada, autonomous trucks have already been licensed to operate and will likely be on the road within the next few years. Driverless cars and trucks will make the roads a safer place and will help to improve energy efficiency of the vehicles as well. Wired, as always, has a good article about many reasons why the Apple Watch isn’t selling like the iPhone or iPad did when introduced. It’s pretty easy to see – it has been out for some time yet I’ve yet to see a person wearing one. Unsurprising – it’s the first Apple product I haven’t wanted to use in as long as I can remember. It will be interesting to see. Will they continue to make new versions, or will they discontinue it? via Why the Apple Watch is flopping. Meet Amy, a Virtual Meeting Aide – will AI replace some outsourcing? When I initially saw this article, I thought it would discuss using an outsourced assistant via a freelancing site or other application. But it’s not – it’s about artificial intelligence. This led me to wonder how much of the work we now outsource will be done using AI in the near future….particularly the “busy work” many of us have done on Mechanical Turk and others…. via Meet Amy, a Virtual Meeting Aide | MIT Technology Review. There are many of these “2020 Work Skills” lists, but I liked this one. It is a blend of intelligences and skills – hard and soft. The 10 Most Valued Work Skills in 2020. Interesting article, but I think there were many more reasons. Video did not have bandwidth, and it was more frustrating than it was useful. But cost was certainly a challenge as well! via The Price For A Videophone in 1955 Was $44,000 Adjusted for Inflation. 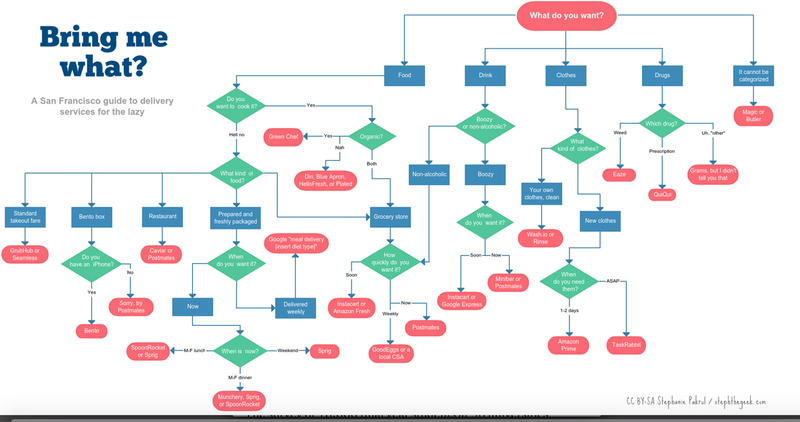 With This SF Delivery Service Flowchart, You’ll Never Go Anywhere To Get Anything Again: SFist. There are so many people who have done this already, without even thinking about it. They simply watch what they want to watch on their laptops or tablets. A sign of things to come….from Wired. via Internet TV’s Big Chance to Oust Cable Is Almost Here | WIRED. Good social media advice from Brian Honigman on The Next Web about the long tail of social media posts. via Using Google+ and Pinterest Search for Long-Term Impact.